Who would you say creates the most messes in your house? Some of you really honest people might say that you are the chief culprits; some will probably say their husbands. But I’m thinking that most would answer: the children. I do believe that children can be trained to become assets in this area and to work with you (instead of against you :-0 ) to accomplish your goals. 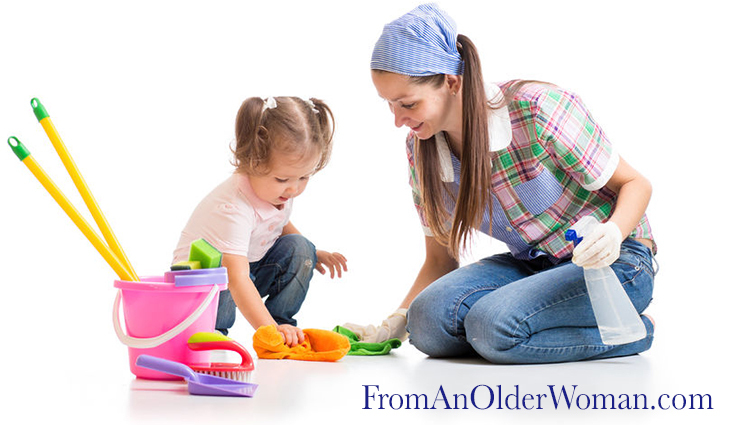 Unless trained otherwise, if children make most of the messes, why should it be Mom’s job to do all the housework? I’m not talking about violating child labor laws or having them work all the time. I’m talking about teaching them to clean up after themselves and to be part of the home team. In our very child-centric culture, it’s not popular to talk about making children do much of anything. “You’re young; have fun!” is the mantra repeated so often that it must be true, right? Nope. How else are you going to teach your children how to work? Most of us live in Suburbia, USA, and don’t have chickens to feed every day, cows to milk, eggs to gather, etc., but we do have homes that need to be straightened and cleaned on a regular basis. When our children were young, we taught them to clean the house. My husband told my children that since I was homeschooling them, they were going to help me with my work. Because we went to the time and effort to train them, we didn’t live in a pig sty, even though I didn’t clean the house for years. The children did it. Was it easy? Nope. Not at all. You’re training them to do something that does not come naturally; you’re going against their natural bents. Sometimes you’re going against your own natural inclinations as well! In the short term you can do it faster yourself. However, training your children in this area not only saves you time in the long term but also is what’s best for them. Little children want to be included in what you are doing. It gives children a sense of worth to participate and teaches them the satisfaction of a job well done. A man once asked me, in front of his wife and others (which made me wonder what the story really was), if homeschoolers should focus on academics rather than on clean houses; my response was that I personally wasn’t interested in raising educated slobs. Besides, if you homeschool, you can call it home economics! Is it in our children’s best interest to have lots of knowledge but not know how to work? While academics were important in our choice to home educate our children, we were more concerned about their characters and their walks with God.